The Spanish high-technology company GMV S.A. won three top prizes for its canine search and rescue positioning system at the sixth European Satellite Navigation competition awards ceremony held on October 21 in Munich, Germany. GMV’s Osmógrafo system receiver is placed on the collar of dogs working on search and rescue missions. It uses satellite positioning, wind speed and direction measurements and the dog’s own sense of smell to determine which areas have been covered by search teams. A radio on the collar stays in communication with a control station. The innovation won the grand prize of €20,000, the special topic prize for safety-of-life application, and the regional prize for Madrid, where GMV headquarters is located. 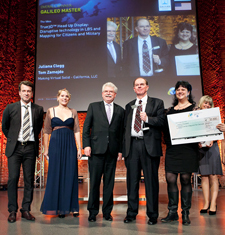 Founded in 2004 and also known as the Galileo Masters Awards, the European Satellite Navigation competition attracted 300 project ideas and applications this year. In addition to the grand prize, seventeen regional and eight special topics prizes were also awarded. German company Alpermon,for AlperCare, a remote support system for fragile seniors living in their homes that alerts caregivers when certain health changes occur. It combines movement sensors, satellite positioning, and mobile text communications. German technical university RWTH Aachen for a security system that uses rail-position markings of the European Train Control System (ECTCS) to verify the defined Galileo positions of locomotives with increased accuracy. The team of Sara Brockmans, Raphael Volz, and Markus Noga of Volz Innovation GmbH for NOGAGO, a high-precision mobile outdoor navigation system that uses unique properties of EGNOS, the EU’s GPS augmentation system. Taiwan’s Industrial Technology Research Institute (ITRI) for TravMate, a real-time touring service for wireless devices that gets travelers in touch with locals and new friends while on the road. German start-up PosITim for software that unites all the GNSSes by providing millimeter-level positioning acurracy for all systems in real time. verified by a trust center to stop transport of counterfeit or dangerous goods. Ludovico de Cinti of Italian technology consultants Altran for distributed networks of GNSS sensors (DNGNSS) for monitoring complex dynamic systems such as atmospheric flows, oceanic surface movements, tectonic movements, and land, air and sea traffic. The 2010 competition will kick off on March 3-5 at the European Commission’s Charlemagne Conference Center in Brussels, Belgium.